It's YOUR World, now BLOG LIKE IT! Meet me in Miami! At the Ritz-Carlton! I'm doing a workshop on Blogging and Book Publishing! Your blog is an expression of you. It’s an outlet to voice your feelings and opinions; a place to share your hopes and dreams. It’s your very own medium used to recount your personal stories and to vent your frustrations. Part of what makes blogging so enjoyable is the ability to connect with other bloggers and to become friends with someone by virtue of this shared experience. Now, imagine a getaway that combines all of the things that you love about blogging with the added element of face-to-face interactions and the intimacy of “IRL” relationships. At BLOGALICIOUS 2010, You’ll laugh, you’ll learn, you’ll let your hair down. It will be just like blogging…only better! The Blogalicious Weekend conferences are aimed at celebrating the diversity of women of all ethnicities in social media. Over the course of 3 event-filled days, savvy, influential and talented women bloggers will ignite a sense of unity within the multicultural blogging community as well as educate marketers on the importance of our demographic in today’s marketplace, all while networking, building relationships, and promoting inspiration and success for each other. See the website: Blogalicious Weekend Event in Miami! One of the most effective ways of advertising your company/book/ministry is through publicity. You can get publicity without spending a single penny. All you need is a coach to get you going in the RIGHT direction and give you the right contacts! 1) Get in touch with the press. What better way to get publicity is to be constantly in touch with the press? Make submitting press releases a part of your marketing plan. Most newspaper reporters won't meet with every single would-be author or business owner that want to meet with them. You can also volunteer to become one of their business columnist or article contributor. Another effective tool you can use is a press release. You can also use it for free because usually, other webmasters or bloggers are more than willing to include them in their sites to add content. 2) Volunteer as a guest speaker. Being part of public seminars or organization meetings can give you the publicity you want. You can volunteer to give a speech and let them know some ideas. Remember, don't make a speech that always talks about you and your business or book! Your speech should be informative! 3) Distribute newsletters for free. Distributing newsletters online needs a very small budget but provides a lot of "bang" for your buck! Use aweber to do it! Newsletters help build a connection to your reader, it's a small step to go from subscriber to customer - and EASY with AWEBER! 4) Offer an interview (online or offline). Press people would be delighted if you can inform them that you are willing to do an interview with them whenever their topic is something you know very well. Approach reporters, bloggers, podcasters and editors and tell them that they can contact you anytime. 5) Send a "letter to the editor". Read the newspaper daily. Not only do you stay on top of your industries news & events, but you can also express your opinion in a letter to the editor. Remember to always be professional in expressing your comments. Use polite words even if you disagree with the article. 6) Offer to teach in a class. Being visible is very important. You can volunteer to teach a class either at a school, church or an organization on your subject. When people see you often, they will begin to see you as the expert on that particular subject. People love to do business with "expert." 7) Write articles and distribute them on the web. Article directories are very popular sites for people who are looking for information on a subject or bloggers looking for more content. Make sure you always include an "about the author" resource box with a link back to your website or blog! How about having it on a site that’s seen by the 100,000,000+ viewers of a national TV show? BRAND LIKE A SUPER STAR! … to promote your message, book, business, and brand on TV so that you can sell more books, attract more clients, and gain the visibility and creditability you deserve. Want to make a TV producer’s job easier? 1. Timely - Make a tie-in to what the media is already covering. Connect what you do, with what they want to know more about. 2. Relevant - “Know the show,” that’s the mantra of the media, be sure that your segment idea is appealing to the target audience of the show you’re pitching it to. 3. Controversial/Conversational - Going against the grain can earn you on-camera time. But don’t try to be controversial just for argument sake, be sure that you can give solid reasons for the point of view you’re presenting. 4. Compelling/Interesting - Make the producer (and therefore the viewers) care about what they’re seeing/hearing. Human interest is a powerful way to create a compelling television segment. 5. Visually Appealing - Television is a visual medium so the more you can “show and tell” the easier it is to convey your points to the people watching. Think of fun ways you can bring the idea you’re pitching to life with props, demos and samples if possible. Strive to include 2 to 3 of these elements in your next pitch and you’ll get what you want - invited to appear on a television show and free publicity - when you give producers what they want - valuable information they can share with their viewers. It’s a total WIN-WIN. Sanyika has a FANTASTIC free video to share with you. This video covers it all. and gain the creditably and exposure you deserve. 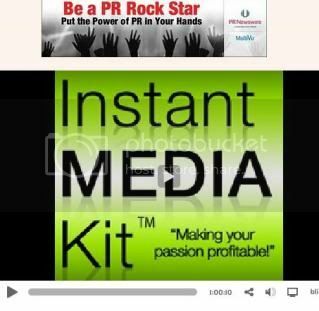 Replay of Instant Branding Webinar and details for webinar TONIGHT! As promised, here's replay of WEBINAR - How to Instantly Brand Yourself as an Expert. world-renowned speaker, industry expert that YOU were meant to be! 09-08-2010 - , Replay of Instant Branding Webinar and details for webinar TONIGHT! Get FREE mp3 on Branding Superstar and Socialmedia-preneur ebook!